Pharmacognosy-Phytochemistry Laboratory, Faculty of Pharmacy, Universities Muslim Indonesia, Makassar, INDONESIA. The aim of this research is to determine of total flavonoid content in the Buni fruit (Antidesma bunius L. Spreng) extract. The extract was produced by stratified maceration method with the different solvent, i.e n-Hexane, Ethyl acetate and ethanol. The analysis of chemical compound using chemical reagent and Thin Layer Chromatography (TLC) method. The method is used to determines total flavonoid contains Buni fruit (Antidesma bunius L.) extract was based on the amount of Rutin Equivalent (RE) were used. The result shows that the flavonoid content higher in the n-Hexane extract is 10.72 %, then ethyl acetate extract is 7.9 % and 3.56 % ethanol extract was counted to or as a Rutin. 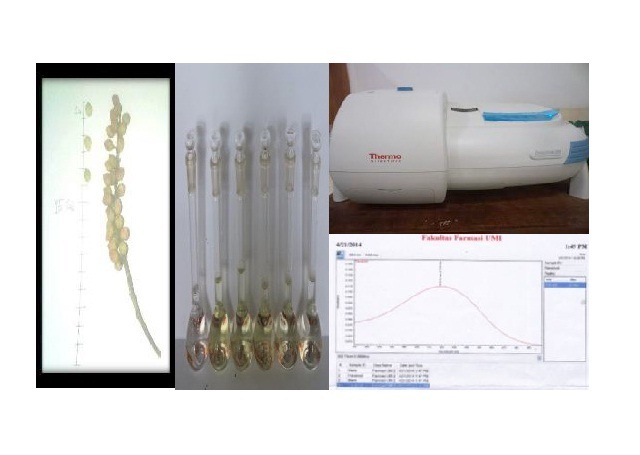 Hamidu L, Ahmad AR, Najib A. Qualitative and Quantitative Test of Total Flavonoid Buni Fruit (Antidesma bunius (L.) Spreng) with UV-Vis Spectrophotometry Method. Pharmacognosy Journal. 2018;10(1):60-63.